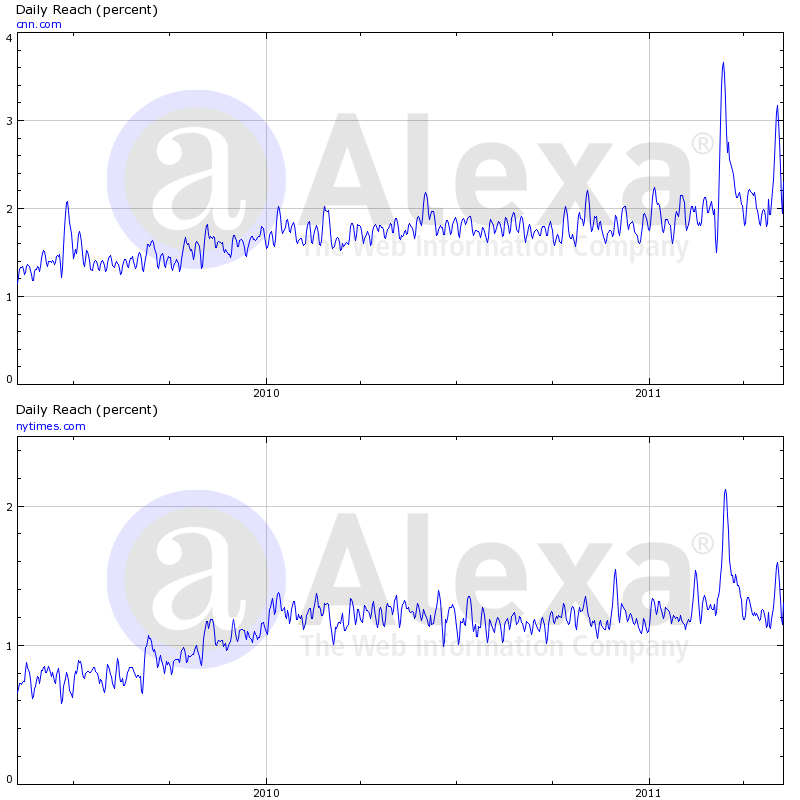 Hi, I have made an interesting finding on Alexa contradicting the common believe, that blogs do not have a lot of readers. In fact, if you combine the reach of all blogs hosted on blogger.com, the situation becomes completely different. While most individual blogs have only a relatively small number of regular (but loyal) readers, the reach and influence sums up by the sheer number of passionate bloggers. For every topic there is a blog covering it, regardless how small the niche is. Something mass media simply cannot afford. 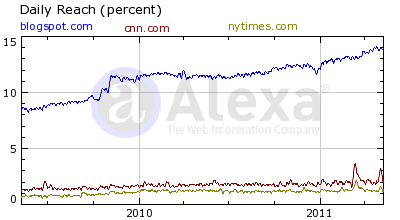 Even without counting WordPress and self-hosted blogs, blogs on blogger.com alone suddenly are the top 5 Web resource according to Alexa, after Google and Facebook but long before any traditional news site (BBC is on position 38, CNN follows on 46, and the New York Times on 83. 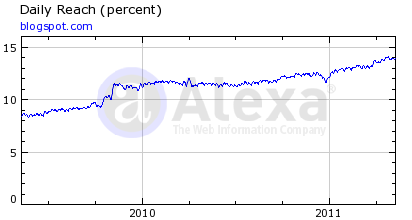 All statistics as of today 2011-05-11). In 2011, most people still do not know what a blog or, let alone, an RSS feed is, even though the chances are high, that you are taken to a blog even without knowing it, if you perform a Google search or click on a shared link on Facebook and Co.
Blogs will really take off, if non-tech savvy users find out, how easy it is to subscribe to blogs through Facebook, Twitter, Bloglovin, Google Reader, or any RSS app. 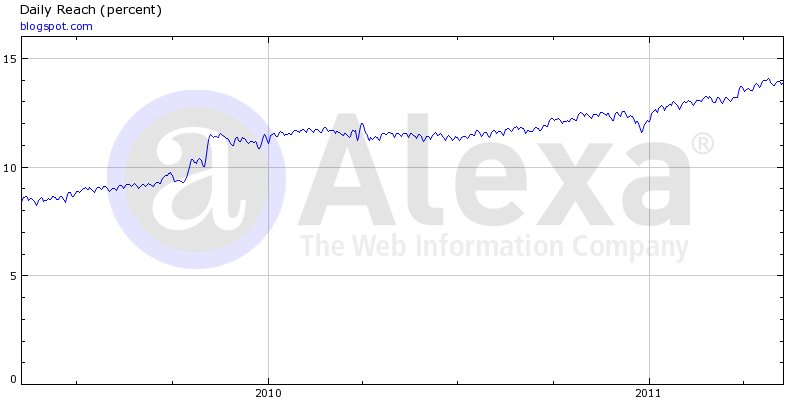 A commercial example of blog aggregation (The Rise of the Superblog) is given in this week's Links á la Mode TECH by the way. Fashion Is More Sociable Than You Think! Express Makes It Social To Shop Using Facebook! Are Your Co-Workers Really Your Facebook Friends?